After four years making do with an alternate landing surface, Northwest Arkansas Regional Airport (XNA) is pleased to be operating with its primary runway back in business. Pronounced and accelerating damage caused by an alkali-silica reaction in the original pavement prompted XNA to close Runway 16-34 for a complete rehab in June 2012 and now the airport is addressing the same issue on the rest of its airfield. Officials began noticing problems with the pavement in 1999, shortly after XNA was built. “We knew there was something a little off because on the soft cut, the pavement wouldn’t break like it was supposed to,” recalls Airport Director Kelly Johnson. Crews removed and replaced about 200 panels of concrete to address the issue, and everything seemed fine until 2004. That was when airport personnel realized that the soft cut lines on a section of the general aviation ramp were no longer lining up; so they painted bars across the joints to observe and measure the movement. Pavement Removed: 119,861 cu. yd. After multiple engineering evaluations and studies, the airport learned that an alkali-silica reaction in the concrete was causing the pavement to move and deteriorate. The $80 million project to fix the problem went beyond new runway pavement to include drainage improvements and the repair and relocation of lighting and navaids. According to FAA AC 150/5380-6C, alkalis and certain silica materials in pavement sometimes react and form a gel that absorbs water. 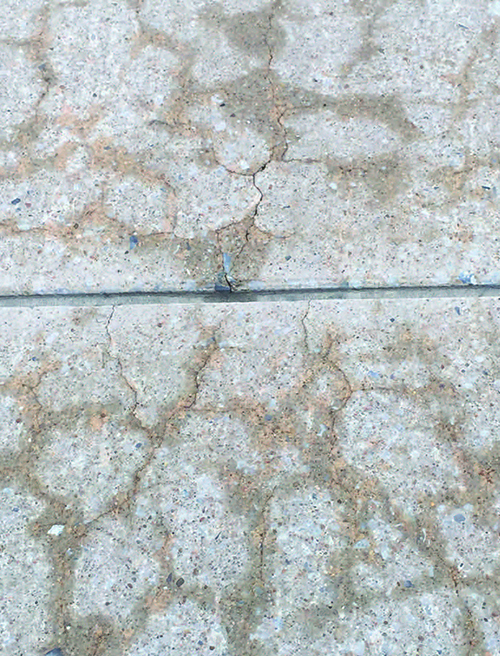 The associated growth in the pavement and internal stress cause expansion that can damage the concrete and adjacent structures. Moisture and heat accelerate the growth of the gel. Over a period of years, it became apparent to airport staff that noticeable damage caused by the alkali-silica reaction was most obvious after a wet spring followed by extreme heat and humidity. In many areas on Taxiway B, the stress in the pavement was so extreme it displaced dowel bars in the concrete by up to 2 inches. To maintain safe operations while it tackled the vexing issue, the airport conducted FOD inspections four times per day. “We just stayed on top of it,” recalls Johnson. Ultimately, airport officials opted to replace the entire 8,800-foot-long, 150-foot-wide runway and its 25-foot-wide asphalt shoulders—nearly 120,000 cubic yards of material in all. Because the pavement bonded to the runway base, the cement-treated base and cement-treated permeable base also needed to be replaced. In addition to installing new pavement, XNA also had to replace associated lighting, electrical and drainage systems. “The end of the runway would grow so much, it would push the asphalt up over 3 inches at the end of the concrete,” Johnson explains. The movement was so severe that it broke conduit and took out threshold lights. Interestingly, XNA’s airfield was not the only project in the area affected by damaging alkali-silica reactions. A local highway constructed with the same aggregate mix, at about the same time the airport was built, is currently exhibiting similar problems in its barrier walls. Busiek explains that no matter how careful engineers are in specifying the right pavement mix, the wrong combination of aggregates, sand and cementitious materials in the concrete can result in an unwanted reaction—and sometimes that reaction is not immediately apparent. Most experts in the field agree that it can take five to 10 years before any noticeable signs of alkali-silica reaction appear. Materials like class F fly ash and lithium can be used to mitigate the risk of a reaction, but there is no guarantee that it will help, adds Busiek. Michael Meyers, deputy manager for FAA’s Airport Engineering Division, says that alkali-silica reactions happen occasionally throughout the industry but are occurring less frequently as the agency continues to conduct research and develop new preventive measures. Cores from XNA’s original pavement were tested and found to be only slightly reactive. “They weren’t bad,” reports Johnson. Storing the samples indoors, however, likely skewed the results. Jacobs Engineering subsequently performed a pavement evaluation at the airport, followed by a summit with all parties involved, including many pavement industry experts. Core samples were taken from the runway, taxiways and ramps for petrographic analysis—a process that includes slicing the pavement into thin layers and examining it under a microscope. Concrete petrographic analysis is used for many types of forensic testing, primarily the basic analysis of coarse and fine aggregate. Such analysis is not required, but it helps positively identify an alkali-silica reaction if an airport is unsure what is distressing its pavement. When the reaction has become destructive, the resulting gel and reactive rings of/around reactive particles can usually be seen by the naked eye, but microscope testing is still recommended for more definitive positive identification. The next step at XNA was an in-depth analysis of all airfield pavement. The runway—which was the first pavement to be poured when the airport was originally built—appeared to be in the worst shape, recalls Johnson. 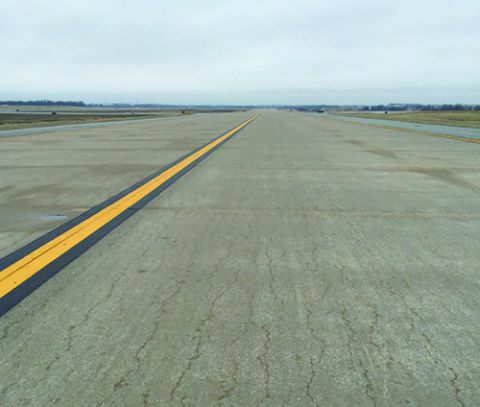 After specialists pinpointed the concrete mix as XNA’s causal issue, the airport and project engineers worked closely with FAA personnel to come up with a different mix design that would be suitable for the new pavement. The airport also tightened its documentation standards. Quarry records must detail the location and content of each material, and they cannot be more than one year old. “A five-year-old quarry record may not represent the materials you’re combining to make concrete in your batch plant,” Busiek explains. “Where they dug then might not have been reactive or have streaks of deleterious material, but where they’re digging today might be totally reactive,” Johnson adds. To detect a possible alkali-silica reaction before pavement is installed, Busiek recommends testing each aggregate type in a concrete mix design individually and then checking them in combination as the ASTM C1260 and ASTM C1567 guidance recommends. The goal is to have less than 0.10% expansion in test samples at 28 days. After performing a cost-benefit analysis, airport officials determined that it was necessary and prudent to rehabilitate XNA’s deteriorating runway. They also opted to construct an alternate landing surface to keep the airport operational during reconstruction. The process to secure funding for the crucial projects began in 2005 and lasted about 4½ years. “We had to convince the FAA we couldn’t just close the runway,” Johnson relates. At the time, XNA was 112th busiest airport in the United States. Several strategies to accommodate ongoing flight operations were considered and dismissed before XNA committed to the idea of building an alternate landing surface. Moving all traffic to an existing taxiway was not possible because of building obstructions, recalls Busiek. Another suggestion was to fix the pavement during nighttime hours by replacing the damaged panels one at a time. That wasn’t feasible either, due to the thickness of the pavement and limited 4½-hour overnight work window. “We’d barely get on the runway before we’d have to get off,” she explains. Much to the airport’s chagrin, alkali-silica reactions affected all of its original pavement—the runway and main taxiway, commercial and general aviation ramps, and even some of the pavement installed in 2004 for a cargo ramp and taxiway. “Unfortunately, it was before we figured out what was going on; so those are also experiencing some of the same symptoms as we saw in the runway and taxiway,” Johnson says. According to Meyers, full-scale pavement replacement is typically the best solution. “Patch work here and there, or just minor repairs, can introduce contaminants that can further aggravate the issue with water and alkali,” he explains. The next replacement project for XNA will be on Taxiway B, at an estimated cost of $32 million. Ideally, the rehab will occur in 2018, notes Johnson. “It’s starting to shear and come apart, particularly around the edges,” she reports. The current plan is to replace affected pavement incrementally, beginning with the worst sections first. As the airport finishes fixing the remaining airfield pavement, it’s also working to mitigate any further damage and protect existing infrastructure. The commercial ramp, which will need to be replaced, extends to the foundation of the terminal; and the general aviation ramp abuts the fixed-base operator facility and hangars. As alkali-silica reactions have squeezed the pavement, maintenance workers have cut openings to release the pressure. After Taxiway B is repaired, Johnson says XNA will be in “fair shape.” Damage to the cargo ramp pavement does not seem to be as accelerated as damage to the runway and Taxiway B. “We’re doing everything we can to keep it maintained and get as much life out of it as we can,” she notes. In addition, the airport received close to $108,000 for the dowel bars and copper wiring it recycled.